Army Institute of Management (AIM) besides regular MBA programme affiliated to West Bengal University of Technology (WBUT) also conducts MDPs for the executives in the corporate organisation. The objectives of the MDPs (Management Development Programme) are to assist in the improvement of existing management systems and practices by providing relevant training to executives at different levels of the organizational hierarchy in corporate India in both private and public sector enterprises. The participants would be provided training with the latest tools, technologies, skills and best practices spanning various streams of management such as General Management, Information Systems, Communication &amp; Soft Skills, Leadership and Change Management, Financial Management, Marketing, etc. MDPs would bring in an additional dimension in Management education activity.Conducting MDPs for corporate executives would add to the knowledge-base and capability-range of the intellectual capital of AIMK as a Management School. It would certainly help in gaining greater credibility and higher respectability as a learning institution. For this, MDP cell at this Institute was established in the year 2000. Since then, a number of open house as well as in-house MDPs has been conducted through this cell. The open house programmes were organized at Taj Bengal; ITC Sonar Bangla; Radission Fort, Raichak; Hyatt Regency, Kolkata. The In-house programs were conducted at the Institute premises. A “Soft Skills Training Programme” was held during 10-11 Feb 2017 for Redington India Ltd, a leading Supply Chain Solution Provider. There were 27 participants who took part in nine sessions spread across two days. Eminent corporate trainers including AIMK faculty members conducted the sessions. This is the second such programme organized for RIL in last one year. Redington is the largest Supply Chain Solution Provider in emerging markets.Redington provides end-to- end supply chain solutions for all categories of Information Technology products (PCs,PC building blocks, networking, software and enterprise solution products) and Consumer and Lifestyle products (Telecom, Digital Lifestyle products, Entertainment products and Digital Printing Machines) to over 100 international brands. Lectures, multimedia-supported presentations, reading, case analyses, group discussion, management games etc. All the participants for both the programmes have taken active participation in all the sessions of the MDP. They participated very enthusiastically in different games conducted during the sessions and were very interactive.Overall conduct / behaviour of all the participants were excellent. They were very courteous within and outside the classroom. 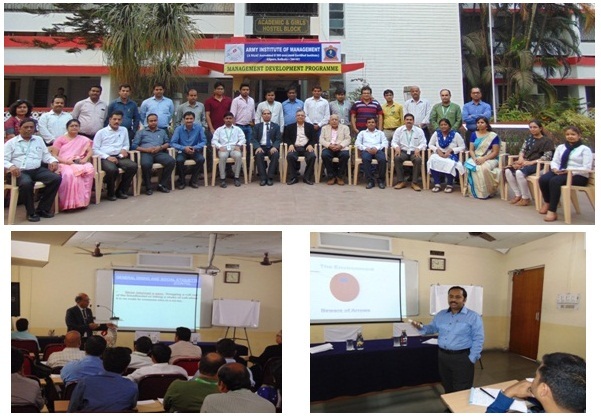 The Programme on “MIS for Managers” was inaugurated by Maj Gen AM Verma, SM, VSM. GOC Bengal Area & Chairman AIM. Twenty participants from different public and private sector companies Titan Industries Ltd, BSNL, WBSETCL, WBSEDCL, MSTC, Manaksia Ltd, DPSC Ltd, ONGC, Jaya Shree Textiles, ITC Sonar- Kolkata & Haldia Petrochemical Ltd attended the Programme. The Programme was conducted by Dr. Biswajit Chakraborty and Prof Sudipto Bhattacharyya. The programme concluded with a panel discussion which comprised personalities from different sectors like Mr. Rajesh Nath of ITC Sonar- Kolkata, Mr. Somesh Dasgupta of DPSC Ltd, Mr. S. Roy Choudhury of Asprirations Consultancy Services, Mr. Arnab Mahalanabis of MSTC, Mr. Prasenjit Roy Chowdhury of ITC Infotech India Ltd, Mr. RN Sengupta of Manaksia Ltd, Mr. Biplab S. Bose of Jessop & Co. Ltd. and Mr Robin Sengupta of AIM. Army Institute of Management also offers tailor –made training programmes for different target groups and companies.